Last winter, I- a Scottish fresco painter, and Carey Mortimer– an English fresco painter, made a trip to Rome, Naples and Pompeii with the intention of examining Roman wall paintings. We are both fascinated by the fine polished technique of this particular era of wall painting and how we could use this in our own, contemporary frescoes. Rome was a flying visit- literally, as that’s where our flights landed. 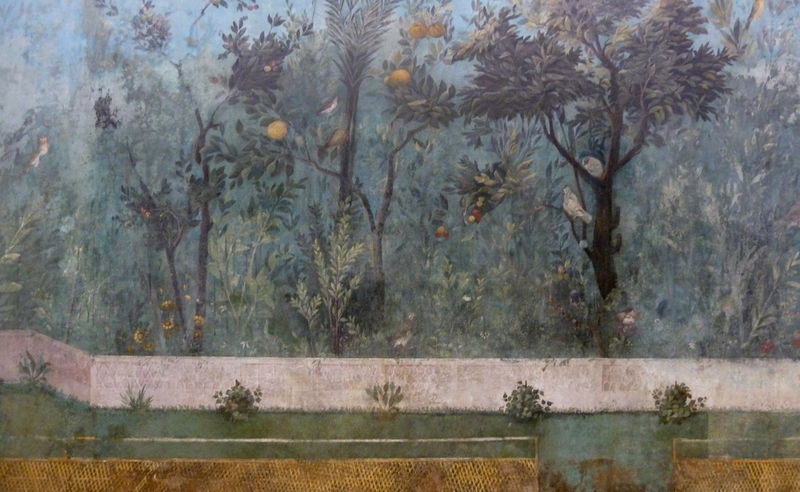 We went to the Palazzo Massimo museum to see Livia’s Garden, an installation of a subterranean dining room discovered north of Rome in the Villa of Livia (Augustus’s wife) and carefully transferred here. The mural depicts a range of botanically accurate trees and shrubs as well as birds flying amongst them. The garden is bound by a wall and a fence and in the distance are mountains. Curiously, there is a small bird cage on the wall. Perhaps it talks about containment and freedom. The whole garden is seen as if through a grotto. It is one of the most beautiful things I have ever seen and I could quite happily have made my bed up in the room and stayed for a week. 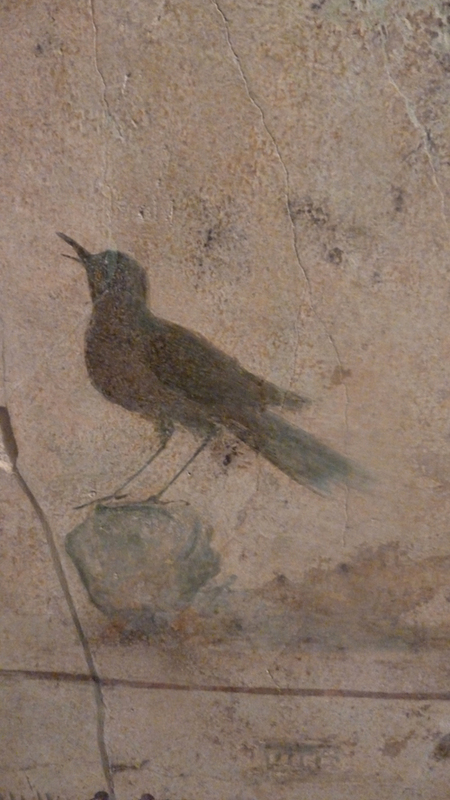 Also in the museum were many other fascinating fresco cycles, some taken from the Villa della Farnesina. The next morning we took the train to Naples and did not hesitate to visit the Archaeological Museum. 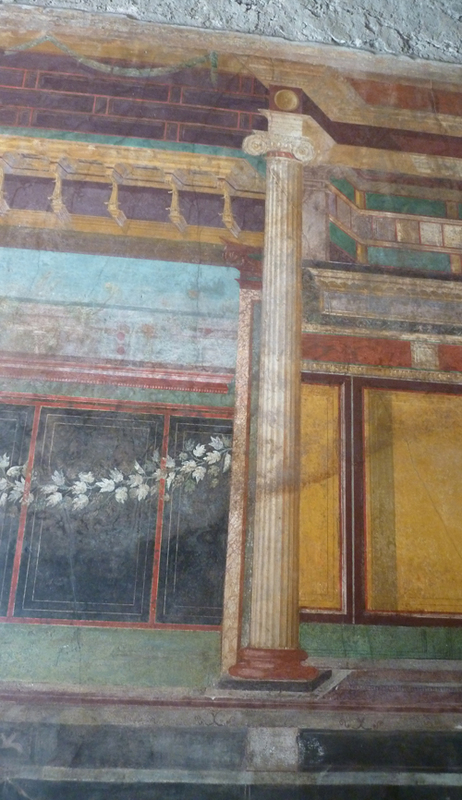 It is full of frescoes, sculptures and mosaics taken from Pompeii, Herculaneum and surrounding villas. Carey and I were keen to scrutinise the Roman wall painting technique. This technique results in a shinier surface than the buon fresco of medieval and renaissance times. Chemical analysis has shown the presence of wax , but whether this was mixed with the pigments or put on top to protect it is debateable. It is true that they used marble powder, rather than sand, as the aggregate to mix with the lime putty. The resultant mortar can be polished with small implements, such as a spoon or a boar’s tusk, to bring up a shine. A raking light shows up small indentations which could be made from such implements. The Romans used a red pigment called cinnabar, which is based on mercury. This goes black if exposed to air, so it could be that these areas alone were covered in the wax. The next day, we went to Herculaneum. This is a much smaller site than Pompeii and can be seen from the road above, which gives a good sense of its lay out. There are only a few wall paintings here, but the method of excavation of the buildings maintains the structure of the facades and gives a good sense of life in the town. Getting back onto the little train, we than went to Oplontis and the Villa Poppaea, a large villa just outside the town of Torre Annunziata. We pretty much had the place to ourselves, so that meant the attendant stuck to us like glue. I think he thought we were going to deface the paintings with graffiti! 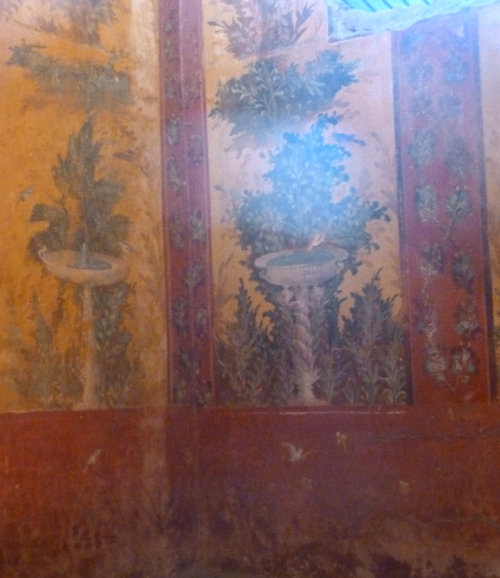 The villa is full of well- preserved wall paintings, some of large architectural schemes in the Pompeian second style. 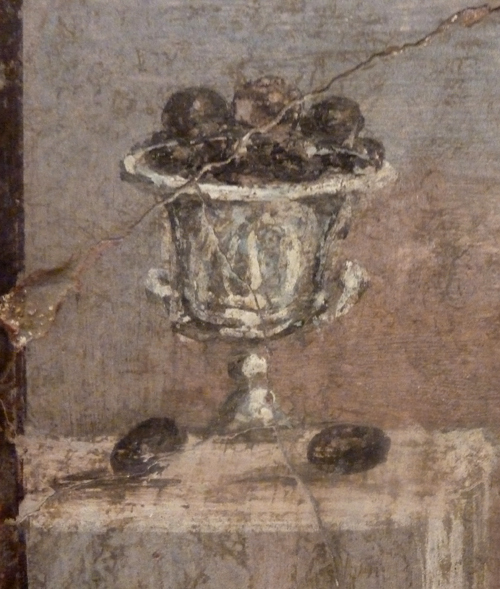 Carey was delighted to find several small wall paintings of birds and baskets of fruit. These were exquisite. I was excited about the series of large fountain paintings. I had previously done a copy of one of them at Carey’s fresco course in Sardinia- Bosa Art School. Unfortunately, much of the area was roped off. I begged the attendant to let me in, but he seemed unwilling to let me in for any more than three seconds, which was very frustrating. I was, however, impressed with the way you could look through various gaps and see a recession of paintings, all in yellows and reds. Back in Naples, we visited the restoration department at the Archaelogical museum, where we were shown the method for removing the frescoes from the walls of the site. We were rather surprised that the touching up was done with Winsor and Newton watercolours! Unfortunately, the restorers there did not know much about the use of wax in the technique and eventually we stopped pestering them with our questions and made our way into the streets of Naples . We had the rest of the day free of Roma frescoes and looked around the Gothic quarter of Naples, which is full of painted churches, one with a magnificent Carravaggio, and tiled monasteries. As it was coming up to Christmas, the streets were full of crib scenes and items to buy to make your own nativity. We sampled a lot of lovely Neapolitan delicacies, such as creamy mozzarella. On our last day, we went to Pompeii. We made our way straight to the Villa of Mysteries which has some very well preserved friezes depicting scenes from the cult of Dionysus. There is a lot of cinnabar here. Anyone observing us would wonder who these two seemingly eccentric women were- we could not take our eyes off the murals and it was all we could do to restrain ourselves from running our hands all over them. 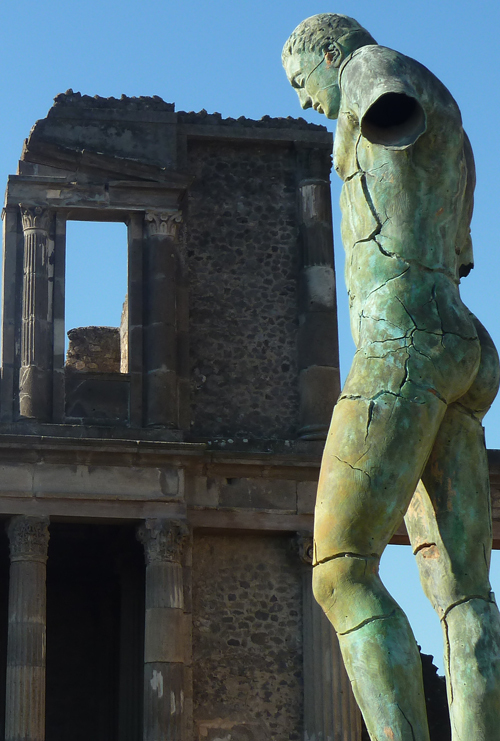 There is a lot to see in Pompeii and we didn’t have a particular plan, but wandered and feasted our eyes. We spent a lot of time in certain areas, such as the small amphitheatre and the main baths. There was a lot we didn’t see, such as the House of the Poet and the House of the Golden Bracelet, but these may not have been open to the public. Several areas were closed off, but other areas had recently been opened, which gave each turn of the corner an element of surprise. There was the added joy of seeing the large figurative sculptures by Igor Mitoraj which complemented the ruins dramatically. After five intense hours of scrutinising the wall paintings and discussing the most minute details we began to get a bit blasé. We found ourselves walking past amazing works of art and just casting our eye over them. Exhausted and full up of art, we decided to save the rest for another trip. I would go back tomorrow if I could. It was the most fascinating art trip I have ever made and I was so pleased to share it with Carey.